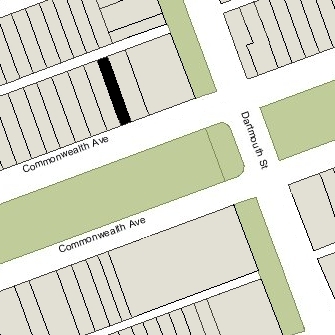 163 Commonwealth is located on the north side of Commonwealth, between Dartmouth and Exeter, with 161 Commonwealth to the east and 165 Commonwealth to the west. 163 Commonwealth was one of two contiguous houses (161-163 Commonwealth) built in 1873-1874 for John Douglas Bates, Jr. He was a shipping merchant in Bates & Co., founded by his father. The land on which 161-163 Commonwealth were built was originally sold by the Commonwealth of Massachusetts at its public sale on December 27, 1870. John Bates either was the successful bidder or acquired the right to purchase the land from the successful bidder. He did not complete the purchase, however, until after the houses were built, taking title from the Commonwealth on October 15, 1874 (both houses appear as completed structures on the 1874 Hopkins map). Click here for an index to the deeds for 163 Commonwealth. 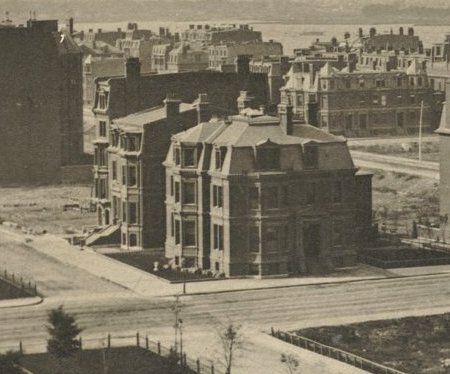 The original lot was 56 feet wide, and John Bates had two houses built on it: a wider and lower house at 161 Commonwealth (about 37 feet 9 inches wide and three stories plus basement in height), and a narrower and taller house at 163 Commonwealth (about 18 feet 3 inches wide and five stories plus basement in height). Bainbridge Bunting’s Houses of Boston’s Back Bay attributes both houses to architect Charles K. Kirby (who is shown as the owner of 163 Commonwealth on the 1874 Hopkins map, although there is no indication in the deeds that he ever owned the property). John Bates made 161 Commonwealth his home and appears to have used 163 Commonwealth as an annex for several years. It was not listed as a separate address in the 1876-1881 Blue Books. On October 28, 1880, 163 Commonwealth was purchased from John Bates by banker William A. Tower. He and his wife, Julia (Davis) Tower, made it their Boston home. Their primary residence was in Lexington. They continued to live at 163 Commonwealth until about 1885. During the 1885-1886 winter season, it was the home of Mrs. Isabella Weir (Hayden) Talbot, the widow of woolen manufacturer and former Governor Thomas Talbot, who had died in October of 1885. Her primary residence was in Billerica. 163 Commonwealth was not listed in the 1887 Blue Book. On October 26, 1886, 163 Commonwealth was purchased from William Tower by a trust established under the will of investment banker Henry Purkitt Kidder for the benefit of his wife, Elizabeth (Huidekoper) Kidder. He had died in January of 1886. They had lived at 2 Newbury before his death. 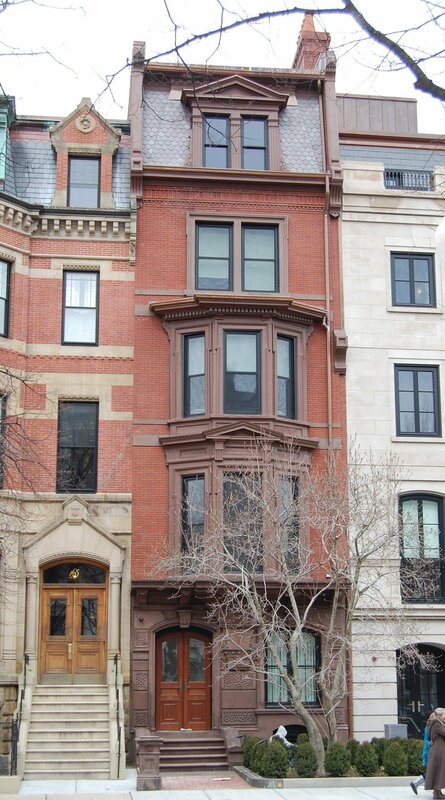 Elizabeth Kidder made 163 Commonwealth her Boston home until about 1939. On several occasions, however, she lived elsewhere for extended periods and leased the house to others. She continued to live at 163 Commonwealth during the 1888-1889 winter season, but then was living elsewhere for the next twelve years. 163 Commonwealth was not listed in the 1890-1892 Blue Books. By the 1892-1893 winter season, it was the home of Susan Greene (Amory) Dexter, the estranged wife of shipping merchant and railroad investor Franklin Gordon Dexter. 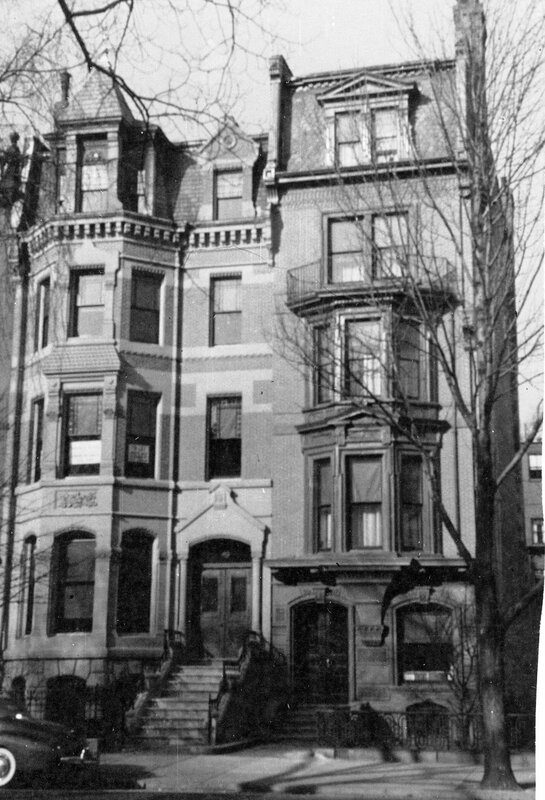 She continued to live there during the 1899-1900 winter season, but by the next season, she had moved to 456 Beacon. During the 1900-1901 winter season, 163 Commonwealth was the home of Rev. Paul Revere Frothingham, minister of the Arlington Street Church, and his wife, Anna (Clapp) Frothingham. They previously had lived in New Bedford, where he had been pastor of the First Congregational Society. 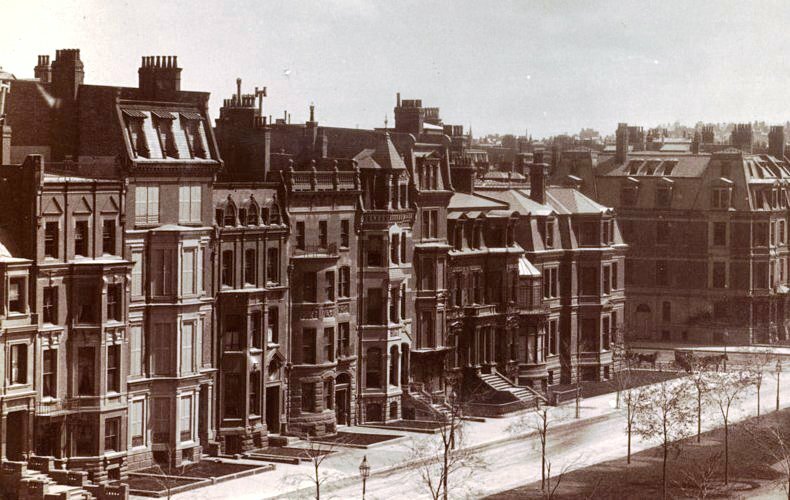 By the next season, they had moved to the Hotel Victoria at 273 Dartmouth, and by the 1902-1903 season they were living at 294 Beacon. 163-165 Commonwealth (ca. 1880), photograph by Albert Levy; Ryerson and Burnham Libraries Book Collection, The Art Institute of Chicago (Digital file #000000_100709-16). 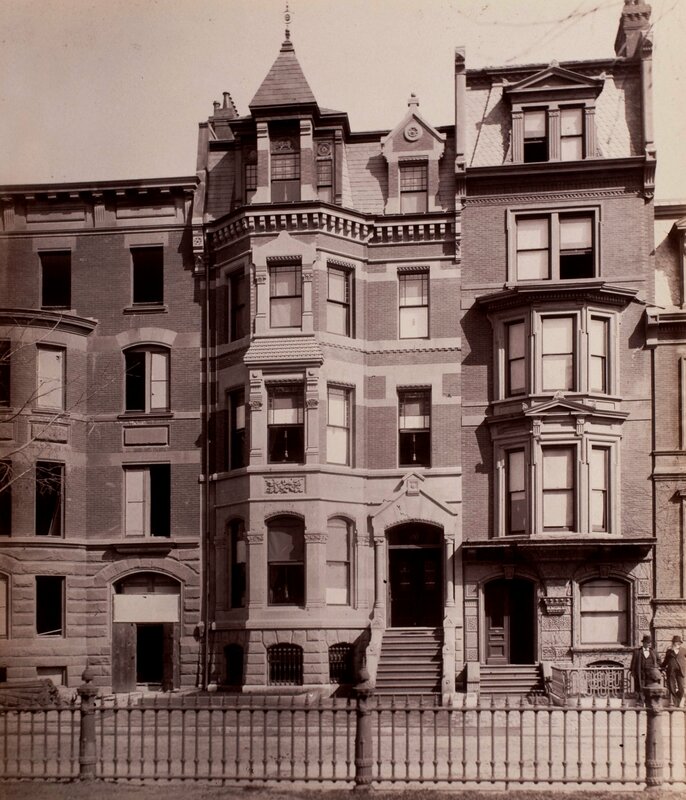 By the 1901-1902 winter season, Elizabeth Kidder was once again living at 163 Commonwealth. She continued to live there until the 1921-1922 winter season, when it was the home of Horace Binney and his wife, Marie Anne (Sorchan) Binney. They previously had lived at 227 Marlborough; by 1923 they had moved to 61 Commonwealth. Elizabeth Kidder resumed living at 163 Commonwealth during the 1922-1923 winter season, and continued to live there through about 1939. From about 1933, she was joined by Miss Elizabeth Lord. The house was shown as vacant in the 1940 and 1941 Boston City Directories. On July 1, 1941, 163 Commonwealth was acquired from Elizabeth Kidder’s trust by Alma Vorland, and on December 20, 1941, it was acquired from her by John Reginald Gundry and his wife, Winifred Amy (Wharton) Gundry. They operated it as a lodging house. They previously had lived at 26 Blagden. On June 24, 1942, 163 Commonwealth was purchased from the Gundrys by Roy Frank Kipp, a lawyer. The Gundrys subsequently moved to Hyde Park. Roy Frank Kipp and his wife, Elouise N. (Ferguson) Patterson Kipp, lived at 178 Commonwealth across the street. Elouise Kipp was killed in the November 28, 1942, fire that destroyed the Cocoanut Grove night club. Roy Kipp moved soon thereafter to 163 Commonwealth, which continued to be a lodging house. In May of 1945, Roy Kipp remarried, to Delillus Crockett, and they moved back to 178 Commonwealth. On January 16, 1968, 163 Commonwealth was acquired by Pierre Louis de Bourgknecht. In April of 1975, he filed for (and subsequently received) permission to legalize the existing occupancy as ten units. In an accompanying letter, his legal counsel stated that the building had ten units when he purchased it in 1968. On October 30, 1980, 163 Commonwealth was purchased from Pierre de Bourgknecht by Neil St. John Raymond, trustee of the Reality Realty Trust. He already owned 306 Dartmouth and the vacant lot at 161 Commonwealth. On January 30, 2008, he transferred 161 Commonwealth and 163 Commonwealth to the 163 LLC, of which he was the manager of record. In April of 2010, Elaine C. Mann, trustee of the 163 Commonwealth Avenue Nominee Trust, purchased 163 Commonwealth from the 163 LLC. On the same day, she (as trustee for the 161 Commonwealth Avenue Nominee Trust) purchased the lot at 161 Commonwealth. In June of 2010, the Trust filed for (and subsequently received) permission to convert the property from ten units into three units.